Gov. 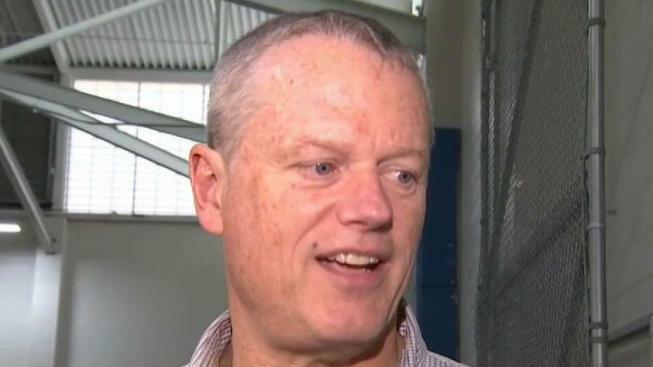 Charlie Baker responded to more criticism from Suffolk County District Attorney Rachael Rollins. Massachusetts Gov. Charlie Baker is clearly intent on turning down the heat on a public back-and-forth between his administration and Suffolk County's district attorney. But Rachael Rollins isn't making that easy. Saturday morning, Baker told reporters he had just called Rollins to apologize for the dust-up Friday when his public safety secretary, Tom Turco, publicly criticized Rollins in a letter responding to her criminal justice reforms. "I think we are going to try to hit the reset button and start again on Monday," Baker said Saturday. At a rally Sunday, Rollins seemed to be on the same page, saying Baker "picked up the phone like a leader does, we had a conversation, which is nobody's business but ours, and now we are moving forward." Rollins said Baker had earned her respect and she had no more to say. But when talking about her male predecessors "moving toward mass incarceration," her tone changed. "The governor did not give a [expletive] about that," Rollins said. "But miraculously, now that this DA wants to end mass incarceration, you're going to question the discretion that we have? No, you are not." Monday, asked if that bothered him, Baker said, "No, I'm looking forward to the meeting that will take place this week between Secretary Turco and his folks and her team." Baker was also asked about Rollins' comment Friday invoking his son, who was accused last summer of groping a woman on a plane. "I'm not much on personal attacks," he said. "I'd prefer to focus on the issues, and that's what I anticipate based on the conversation she and I had on Saturday." Asked if Rollins had apologized to him, Baker said, "That was a really productive conversation that we had and it was between her and me." Five advocacy groups, including the ACLU and the NAACP, signed a public letter to Baker supporting Rollins' reforms. But Baker also has strong support from those who say many of the low-level crimes on Rollins' "no prosecute" list are not victimless.